The University of Cambridge (or Cambridge University), is located in Cambridge, England, and is the second-oldest university in the English-speaking world. The name is sometimes abbreviated as Cantab. in post-nominals, a shortened form of Cantabrigiensis (an adjective derived from Cantabrigia, the Latinised form of Cambridge). 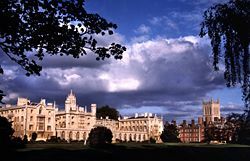 Founded in 1209, the University of Cambridge evolved out of an association of scholars that had escaped to the town of Cambridge from nearby Oxford after a dispute with local townsmen. The University of Cambridge and equally renowned University of Oxford are often jointly referred to by the portmanteau term "Oxbridge," and maintain a long history of academic and athletic rivalry although there are also many links and much cooperation. Their similarities in having a collegiate structure and a tutorial (supervision) system has set them apart from other educational institutions. Both provide an intensity, depth and breadth of education suitable for people who go on to reach the top of their professions. In this way they serve society by providing outstanding leadership. Admissions are based almost exclusively on academic achievement and intellectual promise as the university aims to educate the students who can best benefit from an intensive education. Spiritual, moral, cultural and social education is also an important dimension of the Oxbridge experience which is why students have to be resident in a college for all or most of the term. For many centuries the colleges, and hence the university, were all male institutions. This has changed first with the founding of women's colleges and later by making other colleges mixed. Now there are approximately an equal number of men and women. About half the student body come from independent schools and half from state schools. The University of Cambridge is a member of the Russell Group, a network of research-led British universities; the Coimbra Group, an association of leading European universities; the League of European Research Universities; and the International Alliance of Research Universities. It is also considered part of the "Golden Triangle", a geographical concentration of UK university research. Academically, Cambridge is consistently ranked in the world's top 5 universities. It has traditionally been an academic institution of choice of the Royal Family (King Edward VII, King George VI and Prince Charles were all undergraduates) and has produced 82 Nobel Laureates to date, more than any other university according to some counts. Cambridge University is comprised of a number of institutions, with its main functions divided between the central departments of the university and the university colleges. In general, each department is responsible for performing research and providing centralized lectures to Cambridge students. University colleges are responsible for the general welfare and domestic management of all students and some university staff. The colleges also provide the majority of small group teaching for undergraduates, known as tutorial supervisions. The thirty-one colleges are predominately independent of the university itself and enjoy considerable autonomy. Colleges can decide which students to admit and appoint their own "senior members," or faculty. The university chancellor, a title held for life, is a mainly symbolic position, while the position of vice-chancellor is considered to be the university's chief academic executive. Cambridge University is governed entirely by internal members, with no outside representation in its governing bodies. Ultimate authority lies with the Regent House, the university's principle governing body of which all current Cambridge academic staff are members. The university senate, Cambridge's primary governing body until 1926, is responsible for appointing the university chancellor. The University of Cambridge is considered one of the most academically selective institutions within the United Kingdom. Each year, Cambridge consistently tops the League Tables of British Universities, a system which ranks the top universities within Great Britain. 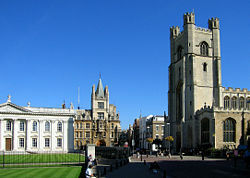 In 2001, according to England’s Research Assessment Exercise, Cambridge was named the top university in Great Britain. In 2005, a British study showed Cambridge to graduate substantially more Ph.D. recipients per year than any other British university. In 2006, a Thomson Scientific study revealed Cambridge to have the highest research paper output of any British University. Cambridge was also named the top producer of research in 10 out of 21 major British fields of research. International rankings produced in 2005 by the Times Higher Education Supplement and Shanghai Jiao Tong University  listed Cambridge among the top three universities world wide. The Times also listed Cambridge first in the field of natural sciences, second in the field of biomedicine and third in arts & humanities. Historically, Cambridge University has produced a significant portion of Britain’s most prominent mathematicians, scientists, and writers. Affiliates of Cambridge University have been awarded a total of eighty-one Nobel Prizes , the most of any university in the world . Seventy of these awardees attended Cambridge as either a graduate or undergraduate student. The University of Cambridge has produced especially distinguished graduates in the field of mathematics and science. This list includes Sir Isaac Newton, Charles Darwin, William Harvey, Paul Dirac, J.J. Thomson, Ernest Rutherford, James Clerk Maxwell, Francis Crick, Alan Turing, Stephen Hawking, and Frederick Sanger. As a leading European university, Cambridge is a member of the Coimbra Group, the League of European Research Universities, the International Alliance of Research Universities, and the Russell Group, a network of large, research oriented British Universities. Cambridge University is also closely linked with the development of high-tech business clusters in and around the Cambridge area. This area is often referred to as "Silicon Fen." In 2004, Silicon Fen was reported to be the second largest venture capital market in the world after the United States’ Silicon Valley. 2006 estimates reported that Silicon Fen housed more than 250 active startup companies, directly linked with the University, estimated to be worth a total of $6 billion in U.S. dollars. In the early thirteenth century, the legendary Roger of Wendover included in his contemporaneous writings that the origins of Cambridge University revolved around a crime committed by two students attending the nearby University of Oxford. In 1209, two Oxford scholars were convicted of a single manslaughter and were hanged by town authorities. In protest over the hangings, the University of Oxford went into voluntary suspension, and scholars began migrating to a number of other institutions which included the pre-existing school at Cambridge (Cambridge had been recorded as a “school” rather than university when John Grim held the office of Master there in 1201). The transferring scholars from the University of Oxford established Cambridge as a university in 1209. In 1233, Pope Gregory IX confirmed Cambridge’s University status in a decree awarding a form of legal protection to the University Chancellor and all attending scholars. In 1290, Cambridge’s status was recognized by papal bull under Pope Nicholas IV, and the visitation of esteemed lecturers and researchers to the university had begun. In the sixteenth century Cambridge University played an important role in advancing Puritan and separatist principles. Robert Browne, John Greenwood, Henry Barrowe, and the future Pilgrim leader William Brewster were educated there, as were other separatist leaders who would influence the theological, ecclesiastical, and political ideals of the Pilgrim Fathers. The atmosphere at Cambridge at this time was pro-Puritan and with a new spirit of reform. Cambridge’s colleges were originally an incidental feature of the university, and began as endowed fellowships of scholars. Institutions without endowments were known as "hostels." In 1284, Hugh Balsham, Bishop of Ely, founded Peterhouse, which would become the University of Cambridge’s first college. Though the majority of colleges were founded between the fourteenth and fifteenth centuries, a number of colleges were established at much later dates. The university's Robinson College was established in the late 1970s. In their early existences, Cambridge colleges were founded so that their students were taught to pray for the souls of their founders. For this reason, many of Cambridge’s colleges were associated with chapels or abbeys. A change in the colleges’ focus would occur in 1536, with the dissolution of the monasteries. King Henry VIII ordered Cambridge University to disband its faculty of Canon Law and to cease the teaching of “scholastic philosophy.” In response, university colleges directed their curricula toward mathematics, the classics, and the Bible. From the time of Sir Isaac Newton in the late seventeenth century, until the middle of the nineteenth century, Cambridge University maintained a strong emphasis in the field of mathematics. Study of this subject was compulsory for graduation, and students were required to take an examination, known as the "Tripos," to acquire a Bachelor of Arts degree. After completing the exam, students earning first-class honors were awarded the title of "wrangler." This exam has defined some of the most famous scholars in British mathematics, including James Clerk Maxwell, Lord Kelvin, and Lord Rayleigh, though some accomplished students, such as Godfrey Harold Hardy, disliked the system and felt that people were too interested in accumulating high scores and not enough interested in the subject itself. Although diversified in its research and teaching interests, Cambridge continues to maintain a strength in mathematics. The Isaac Newton Institute, a division of the university, is widely regarded as the United Kingdom’s most accredited research institute for mathematics and theoretical physics. Cambridge alumni have won eight Fields Medals and one Abel Prize in the field of mathematics. The university also awards a special Certificate of Advanced Studies in Mathematics to scholars of the highest achievement in this field. Originally, only male students were admitted to the University of Cambridge. Girton College, founded by Emily Davies in 1869, was the first college to admit women. Newnham College followed in 1872. During the late nineteenth century, women were allowed to study courses, sit examinations, and have their results recorded, though they were refused the status of full university members. In the twentieth century, women could be awarded a partial degree, known as a titular degree, but were excluded from the governing of the university. Attempts to make women full members of the university did not succeed until 1947. The integration of men’s colleges to include women occurred between 1960 and 1988, though the majority of women’s colleges held the view that until the gender ratio problem was completely solved, they would not reduce the number of women’s places available by admitting men to their colleges. In the 2004 academic year, Cambridge University’s student gender ratio, which included post-graduates, was recorded at 52 percent male and 48 percent female. All students and many of the academics are attached to colleges, where they live, eat and socialise. It is also the place where students receive small group teaching sessions, known as supervisions. Each college appoints its own teaching staff and fellows in each subject; decides which students to admit, in accordance with University regulations; provides small group teaching sessions, for undergraduates (though lectures are arranged and degrees are awarded by the university); and is responsible for the domestic arrangements and welfare of its own undergraduates, graduates, post-doctoral researchers, and staff in general. A graduate remains a member of his or her college for life. The University of Cambridge is divided into thirty-one colleges, three of which, New Hall, Newnham College and Lucy Cavendish College, admit only women. The remaining 28 are co-educational, with Magdalene College being the last all-male college to admit women in 1988. Two colleges, Clare Hall and Darwin College, admit only postgraduates, while the following four admit mainly graduate students: Hughes Hall, Lucy Cavendish College, St. Edmund's College, and Wolfson College. The other 25 colleges admit primarily undergraduate students, though allow for the admittance of some postgraduate students pursuing certain courses of study or research. Although some colleges emphasize the pursuit of a particular subject, such as Churchill College which has a formalized bias toward the sciences and engineering, the majority of Cambridge’s colleges admit students studying a broad array of subjects. This is deliberate as it means that students to meet, talk to and make friends with people from different disciplines thus broadening their education. There are several historic colleges which no longer exist. King's Hall, founded in 1317, and Michaelhouse College combined in 1546 under King Henry VIII of England to establish Trinity College, Cambridge's largest college. Gonville Hall, originally founded in 1348, was again re-founded in 1557 and renamed to Cambridge's Gonville and Caius College. There are also several theological colleges in Cambridge, such as Westminster College and Ridley Hall, which are loosely affiliated with the university through the Cambridge Theological Federation. Cambridge University includes research departments and teaching faculties in most academic disciplines. Though the University’s academic strength is often considered to lie within its sciences, Cambridge is also renowned for a number of humanities and social science faculties. Academic staff, and some graduate students, prepare undergraduate students by both lecture and personal tutorials, where a strict teacher-student ratio of between one-to-one and one-to-three is maintained. This pedagogical system is considered unique to the Universities of Cambridge and Oxford, though similar practices of a different scale can be found worldwide. Though the colleges are responsible for student supervision, accommodations, and most extra-curricula activities, all academic research and lectures are conducted by university departments. During the 1990s, Cambridge constructed a substantial number of new specialized research laboratories on several university sites around the city. Expansion of Cambridge University academic and extracurricular facilities is ongoing. When founded, undergraduate admission to the University of Cambridge relied on a knowledge of Latin and Ancient Greek. This often resulted in a student body that was predominantly drawn from members of the British social elite. In the 1960s, the university admission process began to change. Successful applicants were expected to achieve at least three top grade (A-grade) qualifications relevant to their chosen undergraduate course, or equivalent overseas qualifications. College Fellows also began evaluating candidates on unexamined factors, such as potential for original thought, creativity as expressed in extra-curricular activities, and interview preparedness. In addition to assessing the grades of a potential scholar, admission tutors in some mathematical fields require applicants to pass a series of challenging examinations, or STEP papers. For example, the College of Peterhouse requires a mastering of these examinations as well as top grades in the subjects of Mathematics and Further Mathematics in order to be considered for entry. Between one-half and two-thirds of adequate applicants are offered admission. Public debate in the United Kingdom has often erupted over whether admissions processes at the Universities of Oxford and Cambridge are entirely fair, whether enough students from state schools are encouraged to apply, and whether these students succeed in gaining entry. Almost half of all admitted applicants come from private institutions that charge tuition fees. However, studies have shown that the average qualification for an admitted state school applicant is poorer than the average qualification of an admitted private school applicant. The lack of state school applicants to Cambridge and Oxford has had a negative impact on Oxbridge’s reputation. Subsequently, the universities have made efforts to redress the imbalance by encouraging pupils from state schools to apply. Cambridge maintains a long tradition of student participation in athletics and recreation. Rowing is a particularly popular sport at Cambridge, and races are often held between university colleges and Oxford University. There are also Varsity matches against Oxford in a variety of contests ranging from rugby and cricket, to chess and tiddlywinks. The Cambridge Union serves as a forum for debate while university drama societies, which include the Amateur Dramatic Club and the comedy club, "Footlights," are renowned for producing accredited show business personalities. Student newspapers include the long-established Varsity Newspaper and its younger rival, The Cambridge Student. The student-run radio station, CUR1350, promotes broadcast journalism. The University of Cambridge has a long tradition of academic dress, worn most often on formal occasions. In their first week at Cambridge, many undergraduates will seek to buy or borrow a formal gown when officially enrolling, or matriculating, at the university. Those enrolled at the more traditional colleges most often choose to purchase a gown as the number of occasions on which it is worn quickly repays the investment. Gowns are often "recycled" between generations, as graduate students seek to upgrade their gowns at the start of the academic year. Gowns are most often worn to Chapel and to "Formal Hall," a formal dinner held nightly in some colleges, or once a term in others. Various college events also demand academic dress. For example, the Trinity College statute prefers students to wear academic dress when appearing before senior members, or faculty, on particular occasions; such as appearing before a disciplinary committee. Gowns are also worn, with a hood, to graduation ceremonies, though there exist rules regarding which type of gown or hood a graduating student should wear. However, the general extent to which formal dress applies varies greatly according to college, and some colleges have dispensed with it even for Formal Hall. When wearing academic dress, a person wears both the gown and the hood of the highest degree he or she has already received from the University of Cambridge. Anyone who does not hold a Cambridge degree, such as an undergraduate student or graduate student of another university, wears a gown according to his or her status in Cambridge. In addition, he or she wears the hood of the highest degree which he or she is to receive. The gowns used by Cambridge are divided into four groups: the undergraduate gown, the Bachelor of Arts (B.A.) gown, the Master of Arts (M.A.) gown and the doctoral gown. Hoods are worn on the back of the open-fronted gowns as an indicator of academic status and vary by color according to degree. A form of black cap known as a "mortarboard," or "square," may be worn or carried and is often a part of required dress for graduates. All undergraduate gowns resemble knee-length versions of the B.A. gown, but many colleges at Cambridge have gowns that differ slightly from the main pattern. The standard gown is black, and most colleges' gowns include minor variations such as sleeve decoration. The most distinct differences are the blue color of the undergraduate gowns of Trinity and Caius and the blue facings of Selwyn. The two most common graduate gowns in Cambridge are the B.A. gown and the M.A. gown. Like the University of Oxford, all undergraduates at Cambridge traditionally graduate with a Bachelor of Arts degree after three years, though graduates can obtain a master's degree after a further year of study and graduate with both degrees at once. On ceremonial occasions, the Chancellor of the University wears a black silk gown with train, decorated by a gold lace. This gown is similar to that of the Lord Chancellor's. The Vice-Chancellor, when conferring degrees, wears a scarlet cope trimmed with white fur, as shown in the image. The proctors of Cambridge University are formally responsible for the discipline of junior members of the university. In addition, they have various ceremonial and administrative roles, which, in practice, occupy the majority of their time. Historically, university proctors could be seen patrolling the campus after dark with the university police, or bulldogs. Though this tradition has ceased, proctors maintain responsibility for disciplinary action throughout the Colleges. On ceremonial occasions, Proctors wear the academic dress of a Master of Arts adorned with a distinctive ruff at the neckline, while proctor constables wear top hats and cloaks. Other officials, such as the Esquire Bedell or Orator, wear the academic dress appropriate to their degree during ceremonial occasions. A formal dinner at St Johns College, Cambridge. 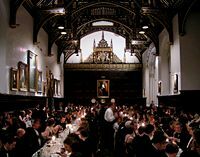 Formal Hall, or formal dinner, involves dining in the collegiate manner served by servants, whilst wearing academic dress, and is typically lit by candles. It is normally preceded (and sometimes followed) by a Grace, which in older institutions may often be in Latin and is frequently peculiar to the institution in question. There may be one or more after dinner speakers at the end of the dinner or even between courses if it is a special occasion. A discontinued tradition is that of the wooden spoon, a "prize" awarded to the student with the lowest passing grade in the final examinations of the Mathematical Tripos. The spoon was over one meter in length and had an oar blade as a handle. The last of these "spoons" was awarded in 1909 to Cuthbert Lempriere Holthouse, an oarsman of the Lady Margaret Boat Club of St John’s College. After 1909, Tripos results were listed alphabetically rather than by score. This made it difficult to determine the winner of the wooden spoon and the practice was abandoned. There are a number of popular myths associated with the University of Cambridge and its history. 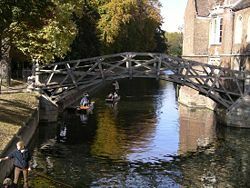 A famous myth relates to the Queens’ College Mathematical Bridge. Rumored to have been constructed by Sir Isaac Newton, the bridge reportedly held itself together without any bolts or screws. Legend has it that inquisitive students took the bridge apart and were unable to reassemble it without bolts. Though the bridge was erected 22 years after Newton’s death, this myth may have arisen from the fact that an early construction of the bridge used inconspicuous iron fastenings, whereas later designs used more visible nuts and bolts. Another famous myth involves the Clare Bridge of Clare College, which is intricately adorned with spherical stone ornaments. One of these ornaments has a quarter sphere wedge removed from its back. Legend has it that the college was dissatisfied with the construction of the bridge and refused to pay its builder in full. The builder took revenge and committed this small act of petty vandalism. Though lacking evidence, this legend is widely accepted and is commonly mentioned during campus tours encompassing the bridge. In 2005, Cambridge University’s total endowment was estimated at £3.1 billion, arguably the highest endowment in Europe, exceeding even that of Oxford University, whose endowment was estimated between £2.4 billion and £2.9 billion at the time. 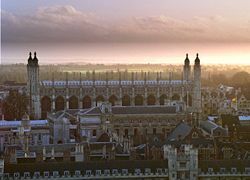 Subsequently, the share of Cambridge’s endowment directly tied to the university itself is believed to exceed more than £1 billion, though Cambridge continues to rely, in large, upon government funding. In comparison with American universities, the University of Cambridge’s estimated endowment ranks between sixth and seventh highest on an international scale. Building on its reputation for enterprise, science, and technology, the University of Cambridge has developed a partnership with the United States' Massachusetts Institute of Technology to create the Cambridge-MIT Institute. In 2000, Bill Gates of Microsoft donated an estimated US $210 million through the Bill and Melinda Gates Foundation to endow a number of Gates Scholarships for students outside of the United Kingdom seeking postgraduate study at Cambridge. The University of Cambridge Computer Laboratory, which offered the world’s first computing course in 1953, is housed in a building partly funded by Gates and named in honor of his grandfather, William. In 1636, Harvard College, the United States’ first institute of higher education, was founded in the town of Newtowne, Massachusetts. In efforts to promote its reputation as an academic center, the town would adopt the new name of Cambridge in 1638. Harvard’s first president, Henry Dunster, first benefactor John Harvard, and first schoolmaster Nathaniel Eaton, were all Cambridge University alumni, as was the first governor of the Massachusetts Bay Colony, John Winthrop. Each Christmas Eve, the British Broadcasting Corporation televises "The Festival of Nine Lessons and Carols" by the Choir of the King’s College Chapel. This has been a national Christmas tradition, since its first transmission in 1928. ↑ A 2005 ranking from The Times Higher Education Supplement of the world’s research universities Cambridge ranked third, behind Harvard and MIT. ↑ A 2005 ranking from the Institute of Higher Education, Shanghai Jiao Tong University of the world’s research universities Cambridge ranked second, behind Harvard. ↑ A list of universities with the most Nobel Prize winner affiliations The University of Chicago has the second most with 78 (30 of which were won by former students). Deacon, Richard. The Cambridge Apostles: A History of Cambridge University’s Elite Intellectual Secret Society. by Cassell, 1985. ISBN 0947728139. Leedham-Green, Elisabeth. A Concise History of the University of Cambridge. Cambridge University Press, 1996. ISBN 0521439787. Smith, J., and C. Stray, (eds). Teaching and Learning in 19th century Cambridge. Boydell Press, 2001 ISBN 0851157831. Willis, Robert. John Willis Clark (ed.). The Architectural History of the University of Cambridge and of the Colleges of Cambridge and Eton. Three volume set. Cambridge University Press, 1988. ISBN 0521358515. History of "University of Cambridge"
This page was last modified on 11 January 2016, at 16:36.